It was (roughly) 1825, and Mrs. Hannah Lord Montague of Troy, New York, had had enough. Her husband, Orlando, a blacksmith, demanded he have a clean white shirt each day. To our modern sensibly, this sounds like a completely reasonable request. But we must keep in mind that at the time, most people didn’t own a shirt for every day of the week, and — perhaps most importantly — the electric washing machine would not be invented for another 85 years. Laundry was done by hand, an arduous process that often consumed at least a day of a household’s routine and utilized a host of less-than-savory materials. Hannah noticed that it was the collars, not the shirts, that were the problem. While the body of the shirt was protected by the high-buttoned waistcoat popular at the time, the collar was exposed to the soot of her husband’s forge and ended each day blackened and limp. In a fit of genius (and, probably, pique) she snipped the collars off of Orlando’s shirts, laundered and starched them separately, and reattached them so as to be easily removable. Her clever idea made her life easier, made her husband happier, and kicked off a style innovation that would change the way men dressed for the next century. The spread of the detachable collar was closely linked to the growing popularity of ready-made clothing as a whole. The industrial revolution simplified the process of creating apparel, and Brooks Brothers was there at the forefront, leading the way with innovations such as our ready-to-wear suits. Like all elements of a dapper wardrobe, the detachable collar was subject to the whims of fashion. Highly starched cotton and linen was deemed too prone to wilting and gave way in time to a stiff cardboard-like paper covered with fine cotton fabric. In 1870, celluloid was invented and quickly adopted as the collar material of choice. Lightweight and flexible, this early plastic was perfectly suited to the crisp, neat style of its day — with a few caveats. The innovative material was more than a little uncomfortable; although flexible, it did not stretch, leading to the deaths of several men who, upon falling asleep with their collars buttoned, cut off the blood supply to their carotid arteries. Celluloid collars were also extremely flammable — a stray spark could set the whole thing alight, badly burning and sometimes killing the wearer. Before long, all but the most dandified had switched back to starched fabrics. Part of the attraction of the detachable collar was the versatility it offered — one could follow the trends of the day by simply buying a new collar rather than an entire shirt. As the fashion pendulum swung from Wing to Point to Golf to Spread and then back, and collars grew as high as four inches up the neck, a whole new look was just a collar away. By the outbreak of World War I, the detachable collar had almost entirely supplanted attached collars. It was not to last, however. 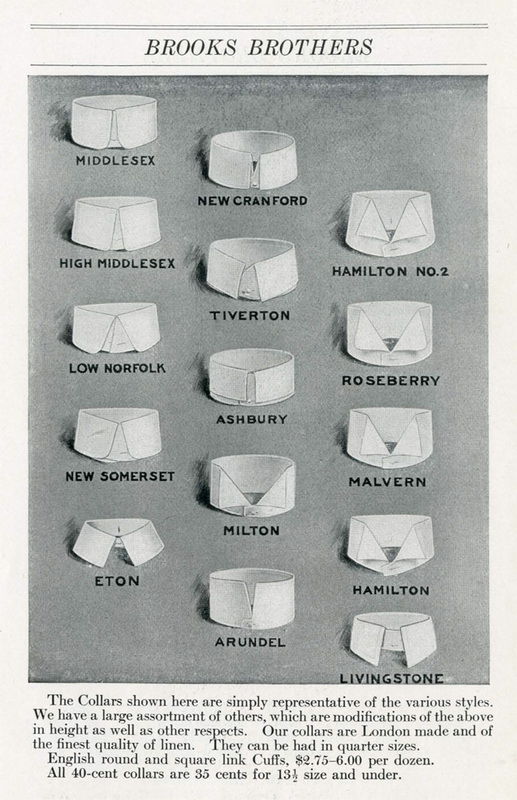 In 1900, Brooks Brothers introduced the button-down-collar oxford. Softer, more comfortable and with its signature bell-shaped roll, this iconic design caught on quickly, first as a casual staple most often seen on sports fields and as part of off-duty ensembles, then slowly working its way into more formal spaces throughout the freewheeling 1920s. 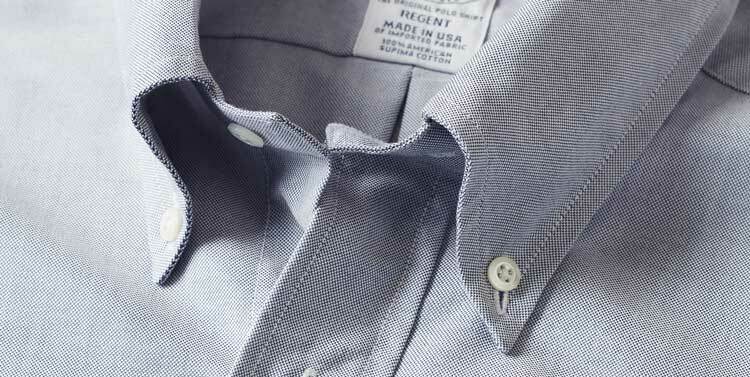 By the late 1930s, the detachable collar’s stranglehold (pun entirely intended) on menswear had softened. Then, in the aftermath of World War II, American culture underwent a systemic change — the G.I. Bill sent thousands of young men to college, swelled the ranks of the middle class, and led to a redefinition of what sophisticated dressing meant as the Ivy League look swept the nation. 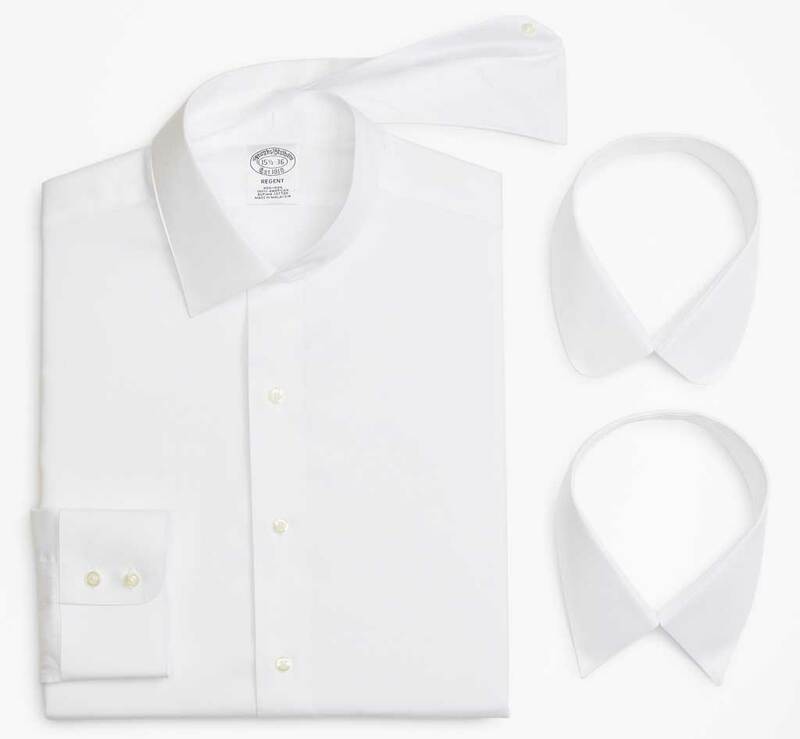 In honor of our 200th anniversary, we’ve reinterpreted this historical design to create the Interchangeable-Collar Shirt, a timeless, three-in-one style that echoes the polish of a bygone era. This classic piece is crafted from ultra-soft, American-grown Supima® cotton (don’t worry, no hazardous celluloid here!) and specially treated to remain virtually wrinkle-free. We’ve included three collars — a sharp Forward Point, a semi-spread Ainsley and a rounded Golf — to give you the same easy versatility that made the detachable collar so beloved in generations past.